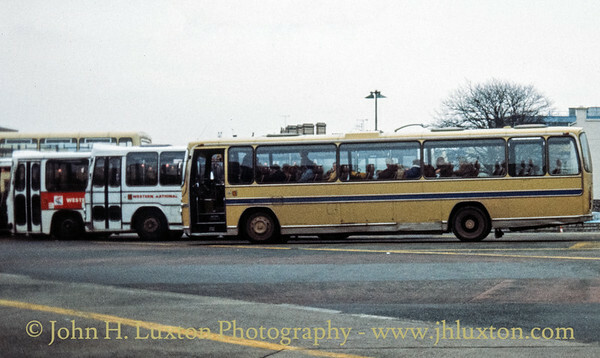 35mm Archive photographs of independent bus companies in south west England photographed in the 1970s and 80s. 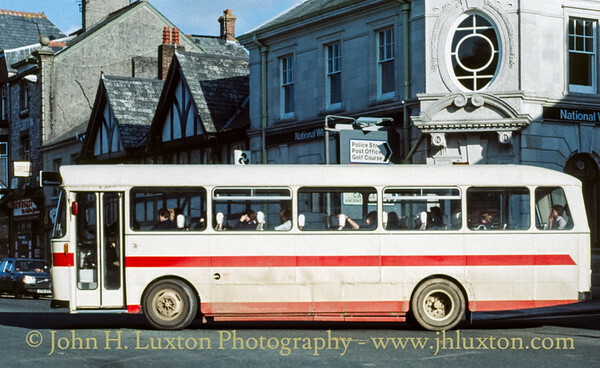 AG & M Deeble (Caradon Riviera Tours) Leyland Leopard KAF895P picks up passengers outside Launceston Town Hall bound for Upton Cross outside Launceston Town Hall - August 25, 1981. 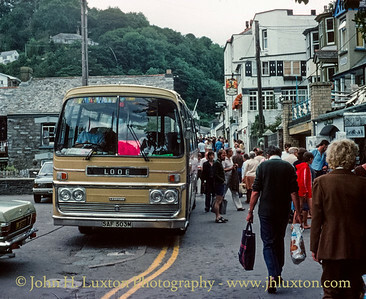 AG & M Deeble (Caradon Riviera Tours) Leyland Leopard SAF503M operating the Looe to Polperro service which connected with the branch line service to Liskeard. - August 18, 1980. 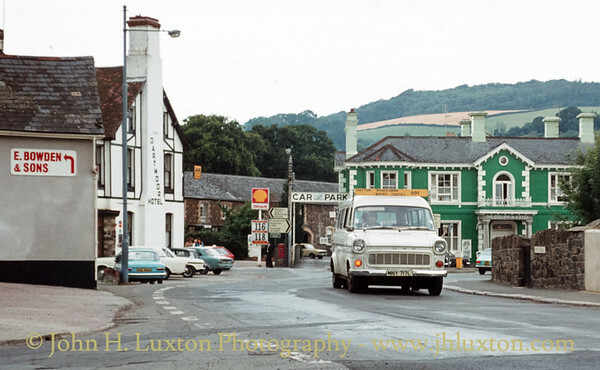 Ford Transit MNY717L seen arriving at Bovey Tracey on the 891 Pony Express Service from Widecombe on August 04, 1979. 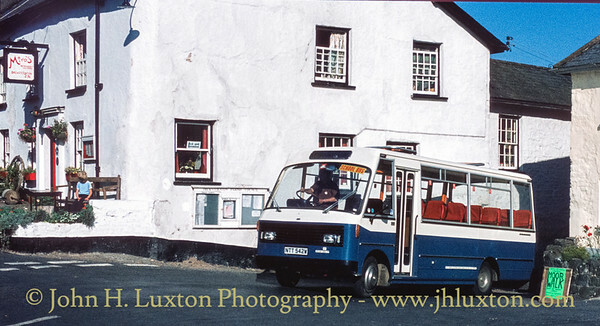 At Bovey Tracey connection was made with service 173 to Newton Abbot operated by Devon General from Chagford and Moretonhampstead. The petrol price at the garage is interesting £1.18 bought a gallon of 4 star! 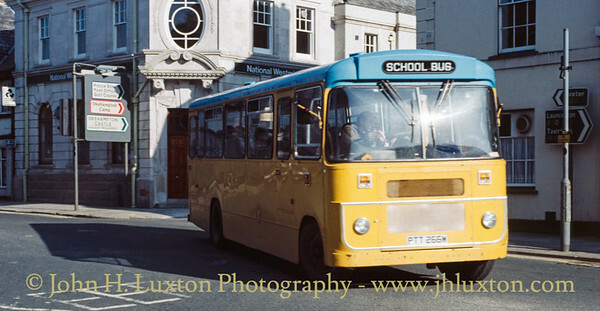 Bruce & Parker trading as Born's Tours operated some elderly buses on mainly schools contracts from a depot in Okehampton. 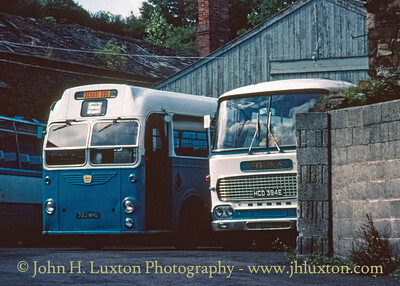 Here a Bristol MW 5G 383MHI ex Bristol Omnibus Company is seen along side ex Southdown Motor Services HCD394E a 1967 Leyland Leopard PSU3/3RT at the company's Okehampton Depot on September 12, 1980. Bruce & Parker trading as Born's Tours operated this AEC Wiillowbrook on schools contracts. 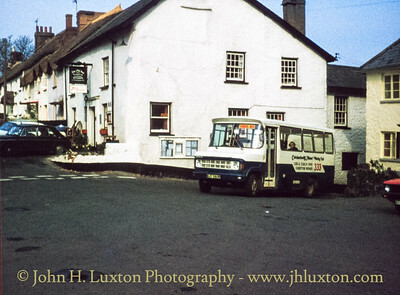 It is seen here in Okehampton after leaving Okehampton College at the end of the school day - March 24, 1985. 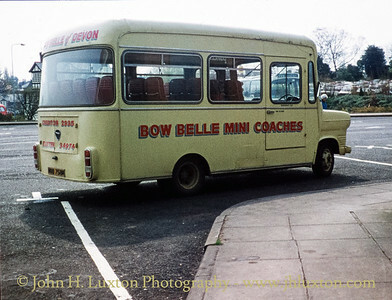 Bow Bell Coaches Ford Strachan Transit mini coach MOD758M seen at Exeter Paris Street Coach Station on April 17, 1980. Scanned from a 110 format slide. 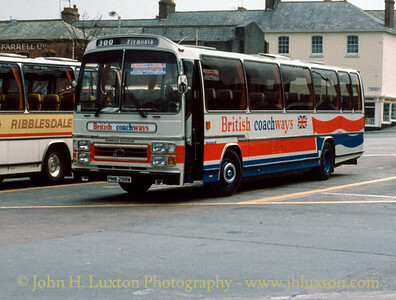 British Coachways was a short lived rival to National Express between 1980 and 1982. 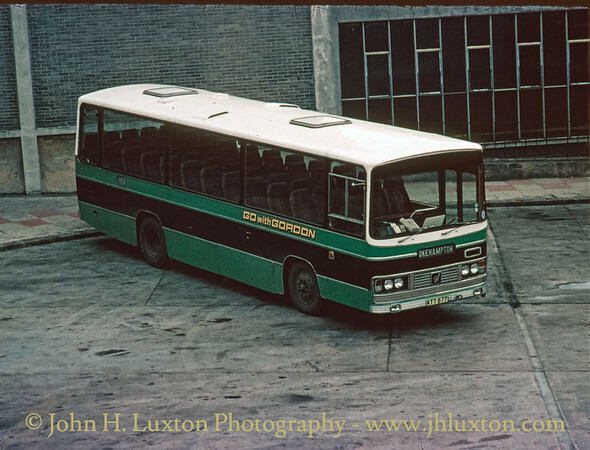 Here a Leyland Leopard is seen at Plymouth Breton Coach Station it was operated by one of the members of the British Coachways pool - Wallace Arnold. September 07, 1981. Bruce & Roberts AEC Reliance OFN717F (ex East Kent Road Car Company) at Portgate on the old A30 road operating on the 620 Tuesday and Saturday shopping service which operated between Lewdown and Launceston - on Saturday the service commenced further east at Bridestowe. 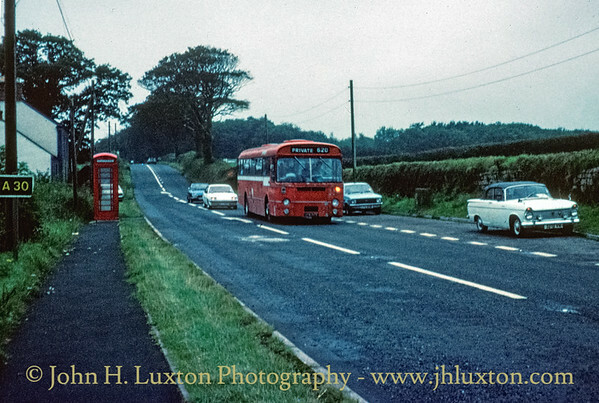 Today the former A30 road Is served by a much better frequency of service between Okehampton and Launceston. 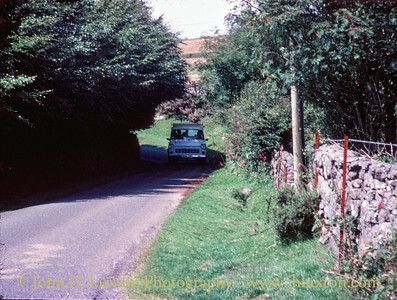 My father's Hillman Super Minx can be seen parked in the lay by. September 16, 1980. Scanned from a 110 format slide. Crockernwell Motor Works Ford Unibus MJY380R parked in the bus stop opposite the company's garage and depot at Crockernwell. 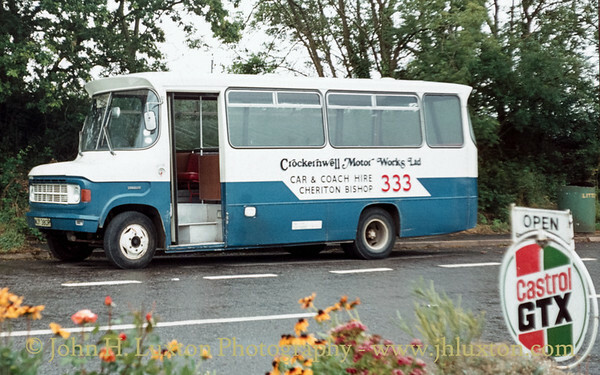 Crockernwell Motor Works was a traditional country garage which also operated buses on schools contracts and some local services between school hours. Crockernwell Motor Works Ford Unibus MJY380R arrived at Drewsteignton on the Wednesday and Fridays Only Crockernwell to Newton Abbot via Manaton service. April 16, 1980. Scanned from a 110 format slide. Fard Faro NTT542W enters the square at Dresteington on the Wednesdays and Fridays Only Crockernwell to Newton Abbot service. 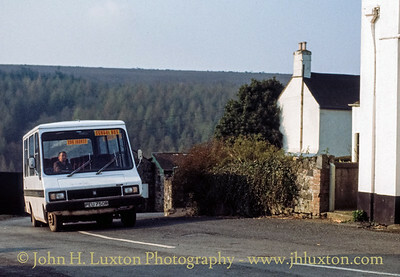 This new bus replaced the company's Ford Unibus and being larger necessitated a slight change of route as it was too wide to cross the bridge at North Bovey. August 27, 1981. Crockernwell Motor Works Fiat Minibus PEU750R approaches Dresteignton Square on its way back to the depot at Crockernwell after a school run. April 07, 1982. 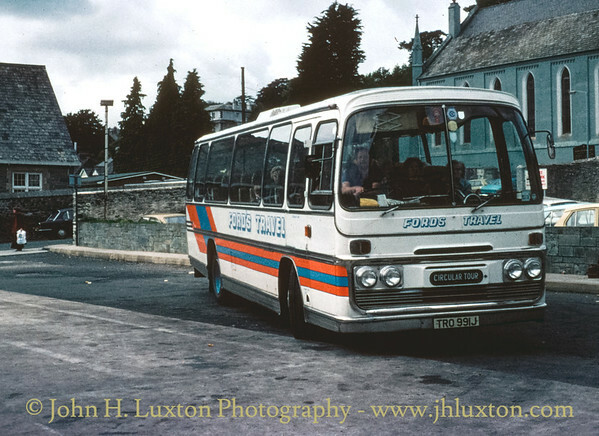 TRO991J a Leyland Plaxton Panorama operating for Ford;s Travel of Gunnislake, Cornwall on the services into Tavistock Devon. 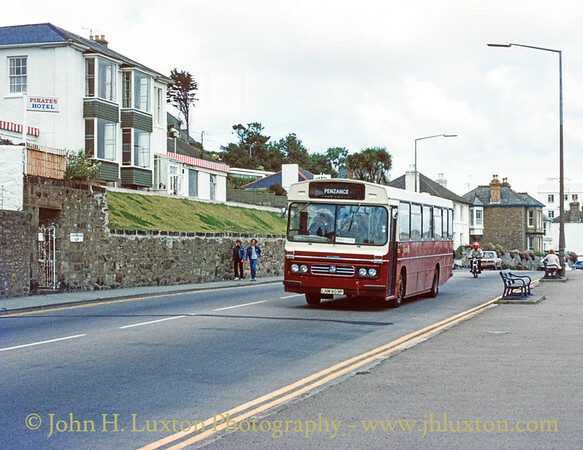 Seen here at Tavistock Bus Station - September 12, 1980. Bedford YRQ - Willowbrook Expressway ATT877L was originally with Okeridge Motor Services of Okehampton from 1972 and passed to "Go With Gordon" of Northlew in 1980. 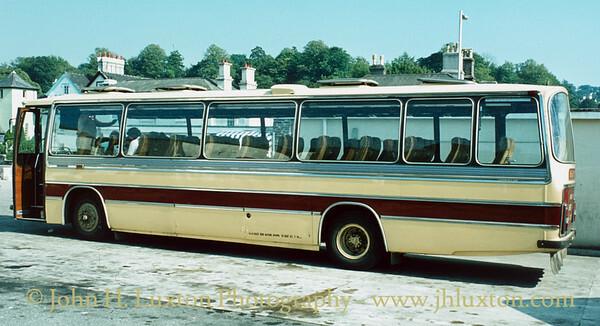 However, it continued to operate on hire to Okeridge Motor Services and is seen here at Plymouth Bretonside Bus Station on service 626 Okehampton - Tavistock - Plymouth which ran Tuesdays, Thursday and Saturdays. September 13, 1990 - scanned from a 110 slide. Former Bruce & Roberts AEC Reliance OFN717F seen after sale to Gusciott's Coaches Guscott's Coaches operating a school service from Okehamton School (now Okehampton College). Note the traffic warden manually operating the traffic lights. This was done every day to allow all the school buses which departed in all directions at this busy road junction. March 24, 1985. 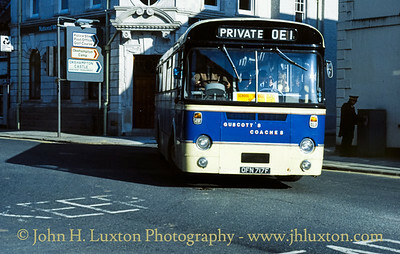 A Bedford Viceroy bodied coach emerges from George Street on a school service. March 24, 1985. 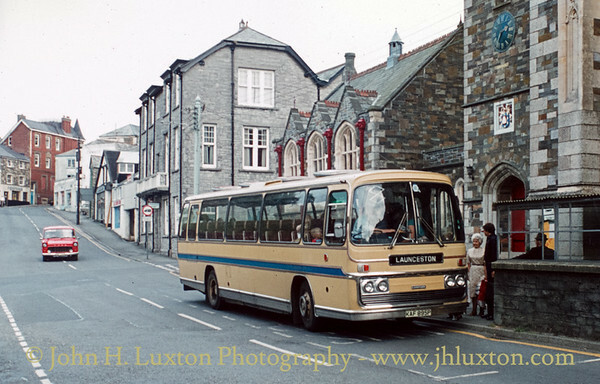 A Leyland coach operated by H&A Sleep of Bere Alston awaits passengers at Tavistock Bus Station on August 28, 1981. 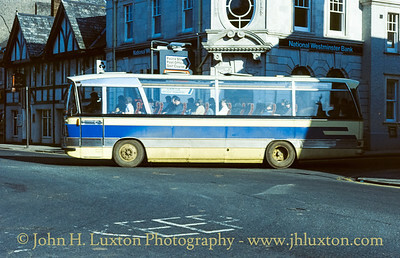 This service was a rail replacement service introduced between Tavistock and Bere Alston to replace the railway service provided by British Railways Southern Region which was withdrawn in 1968.